Above: I’ve never seen the water level this low at Fernilee. As well as sections of stone walling, it’s just possible to make out a brick pillar on the far shoreline (inset). I think this could be one of the supports for the suspension bridge. 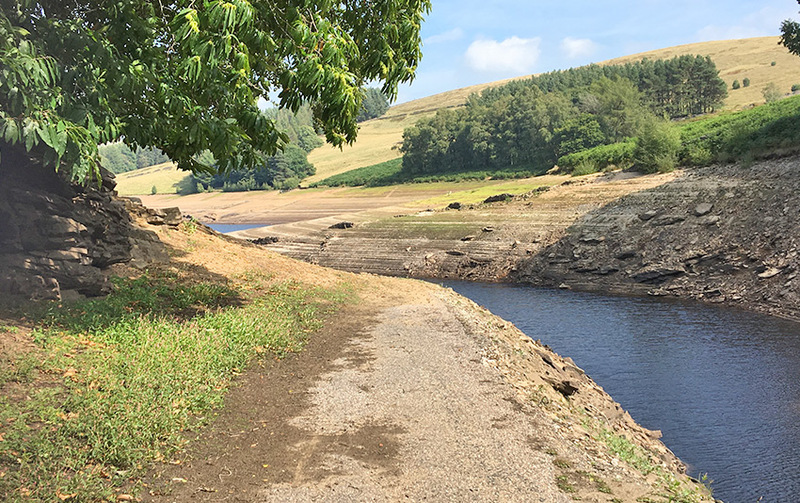 The record-breaking temperatures during the summer of 2018 saw the water levels drop significantly in both reservoirs. I was hoping that something of Goyt’s Bridge might break the surface, but it wasn’t to be. However, some features did appear that I hadn’t seen before. Click on any of the photos below to view larger versions. 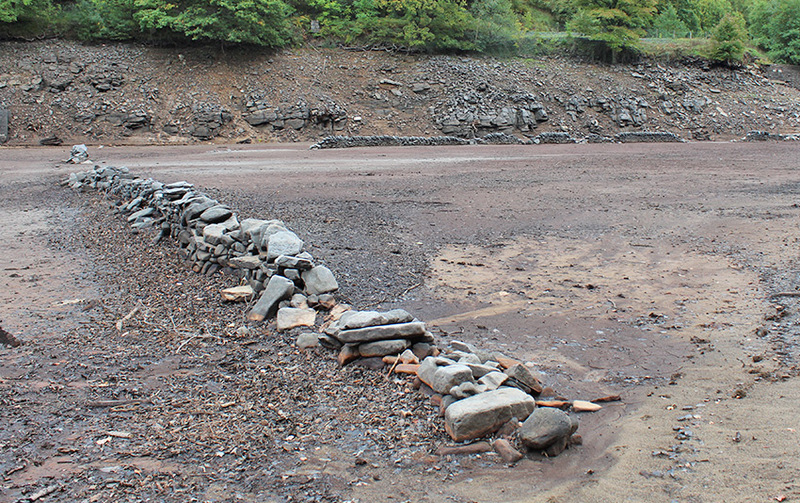 A closer view of the stone walling in the top image, at the southern end of Fernilee Reservoir. The road from Derbyshire Bridge as it approaches Goyt’s Bridge taken at the southern end of Errwood Reservoir. 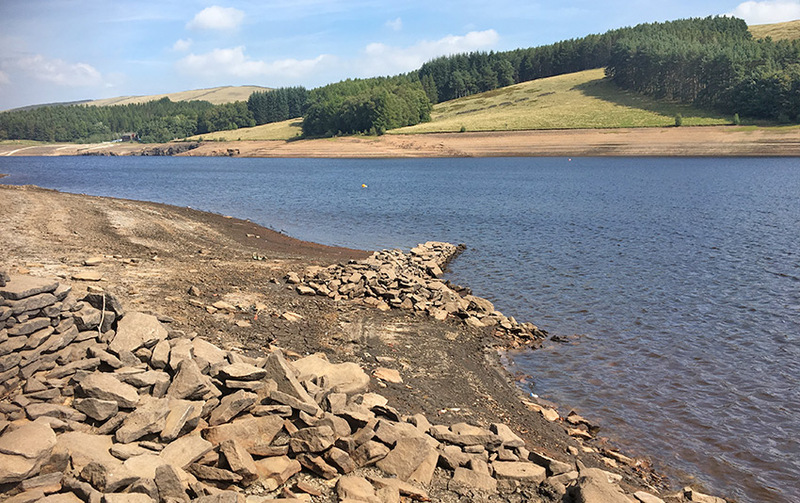 A section of stone walling that once stood within the hamlet of Goyt’s Bridge rises from the southern end of Errwood Reservoir. 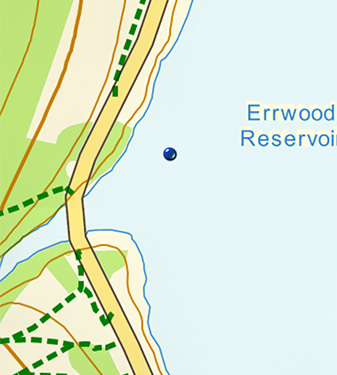 The blue dot on the map on the left is from a GPS app and shows where I was standing to take the photo. 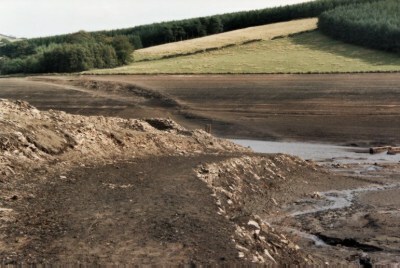 These two photos from the Whaley Bridge Local History website show how low the water level at Errwood Reservoir dropped in 1994. The top photo shows the drive from Errwood Hall to the drowned hamlet of Goyt’s Bridge, which today runs under the modern bridge. On the right it’s just possible to make out the remains of Errwood Bridge, which is also shown in greater detail in the second photo. The picture of the brick pillar, I am sure this has nothing to do with the suspension bridge. The bridge pillars were dressed stone, the bridge was further down. Years ago I found the remains of the anchor points for the suspension chains in the field a few 100 metres further down. I can recall in the late 1950’s, a very dry summer, when it was possible to walk under the suspension bridge. I wish I had taken a picture of that. I agree with Dennis on this. There’s an interesting photo fourth from the top here. 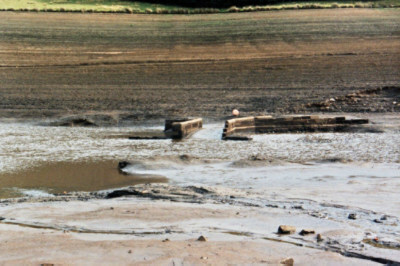 Judging by the position of the cofferdam in the photo and also the position of the modern Errwood overflow it looks like the suspension bridge is actually under the present Errwood dam.